Fitspo… Thinspo… are these even real words? Yeah. 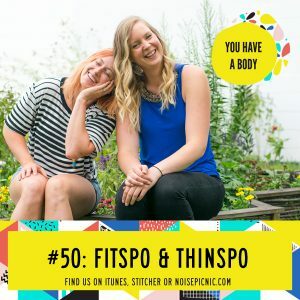 Unfortunately, they are, and they play a very large role in the media imagery you see every single day regarding bodies–yours, hers, theirs, and everyone’s in between. Listen on then for Hannah and Lucia’s thoughts on where these “inspriational” memes and images are coming from, why they’re so pervasive, and what to do about it! Challenge: post a picture on social media of you in your wonderful body doing whatever you want! Then tag us #youhaveabodypodcast and #comeasyouare (we’re @youhaveabodypodcast on Instagram, @youhaveabody on Twitter and www.facebook.com/youhaveabodypodcast on Facebook!) so we can see the wonderfulness and give you big, big virtual hugs!